Go here for the latest results in New Brunswick’s provincial election. On their campaign buses, New Brunswick Conservative Leader Blaine Higgs and Liberal Leader Brian Gallant get ready for a televised debate. New Brunswickers head to the polls on Sept. 24. On the morning after his toughest day yet on the campaign trail, the retired oil executive angling to unseat the youngest premier in Canada sat on his blue coach bus with a bottle of Tylenol at the ready. “This was never on my bucket list,” Blaine Higgs said. The leader of New Brunswick’s Progressive Conservative Party, in the midst of his first contest to become premier, was still recovering from a shove onto the defensive by Brian Gallant, a dimple-cheeked former hockey and tennis player-turned lawyer in the hunt for his second mandate. Political leadership for Mr. Higgs, a former provincial finance minister, is a retirement pursuit. Mr. Gallant, 36, is career politician. His first run for office was in his fifth-grade class; he stepped into the provincial political spotlight more than a decade ago, in his mid-20s, when he challenged Progressive Conservative premier Bernard Lord, and lost. Of Acadian and Dutch descent, he had immediate heartthrob status (he won a Mr. New Brunswick pageant as a university freshman and, earlier, a mall contest for impersonating a Backstreet Boy). Although Mr. Gallant shed his bachelor status last year, his youth continues to appeal to New Brunswickers, who have a long-standing tradition of electing young leaders: four of the province’s past seven premiers won the role in their 30s. The Liberals' Mr. Gallant speaks with a supporter at a gas station during an impromptu stop in Moncton. Election polls suggest Mr. Gallant’s Liberals are likely to win a second mandate, but victory is not certain: No premier has managed to win a second consecutive term in the province since 2003. With less than a week left before election day, both candidates have settled into campaigns of reassurance that some observers argue mute the high stakes New Brunswick will soon have to reckon with. “It’s becoming a contest of who will be protecting health and education. But protecting means freezing the status quo,” said Richard Saillant, an economist and author of A Tale of Two Countries: How the Great Demographic Imbalance is Pulling Canada Apart. Only Prince Edward Island receives more federal cash than New Brunswick, where the Auditor-General recently tabled a damning report on provincial finances that declared getting “a handle on this problem will be like turning the Titanic.” The damage is not one government’s doing; the ship has been listing dangerously for years. Over the past decade, in which both Progressive Conservatives and Liberals have governed, New Brunswick’s net debt has doubled to more than $14-billion, far outpacing the increases posted in other Atlantic provinces. Job opportunities and the working-age population are shrinking. Required job skills are not always a match for open positions in the bilingual province. Deaths now outpace births; in 2017, the province had its lowest number of births since Statistics Canada began tracking figures in 1946. Population forecasts for the next decade predict a decline of between 40,000 and 100,000 residents. However, the election campaign has mostly steered clear of focusing on such alarming statistics. This includes Mr. Gallant, who, in an interview, wanted to draw attention to his new wife, Karine – this is the first election in which he has shared the spotlight with a partner – before discussing his platform. Visibly tentative in the public eye, Mrs. Gallant has nonetheless hovered close to her husband throughout the entire campaign. She is a quiet presence on his bus, but her smile has Meghan Markle wattage. Supporters have watched, rapt, as the notoriously health-conscious couple sampled local potato chips, lobster rolls, even beer. With cameras clicking, they have read storybooks to preschoolers and bestowed arm pats on elderly supporters. Mr. Gallant and his wife, Karine Lavoie, laugh while having dinner on the picnic tables at The Clam Digger during a campaign stop in Chamcook. Children listen as Mr. Gallant reads a story at Cheryl’s Home Away from Home Daycare in Saint John. The pair are somewhat of a distraction from the Liberal platform, which is built on the themes of fairness and opportunity and chock-full of spending promises designed to propel the economy. There is a plan to freeze power rates over four years, introduce private-sector pay equity and provide subsidized child care to low- and middle-income families. Three economic “superclusters” will be created; youth who have left the province will be lured back with help finding jobs. If elected, Mr. Gallant’s government would hold off on balancing the budget until they are three years into their mandate. But Mr. Higgs’s Progressive Conservatives say they can do it in two years. Economists fear Mr. Gallant’s plan to spend the province’s way to prosperity is not realistic. Prime Minister Justin Trudeau indicated earlier this year he supports Mr. Gallant’s approach. “You can’t cut your way to success, you have to invest wisely,” Mr. Trudeau said in an interview with a local newspaper during a stop in New Brunswick earlier this year. Mr. Emery read the comment as an endorsement of Mr. Gallant. “It seemed to imply that the federal government would be along to help things out,” he said. March 22: Prime Minister Justin Trudeau, right, meets with Mr. Gallant in Sussex, N.B. The campaign has been full of signs that the federal Liberals are pleased with Mr. Gallant, whose escalating profile is rare for a New Brunswick politician who does not hail from a political dynasty. 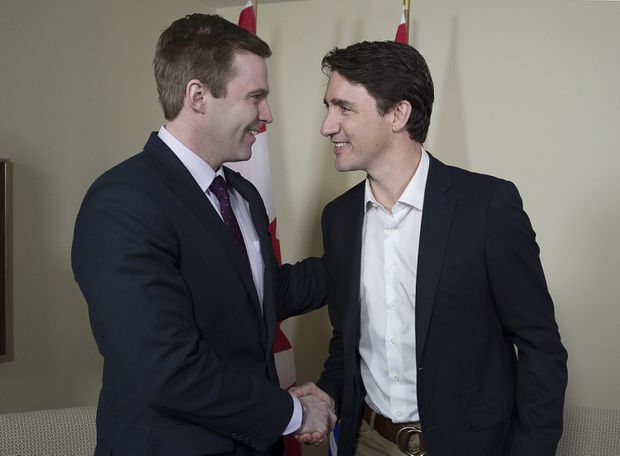 He is close with local MP Dominic LeBlanc, who campaigned for the Premier earlier this month – Mr. Gallant initially met the cabinet minister when he gave the MP’s stepson tennis lessons. Having grown up with blue-collar roots – his father worked in grocery stores – Mr. Gallant taught and coached sports to help pay his way through university. Mr. LeBlanc encouraged Mr. Gallant to run for the provincial party’s leadership in 2012, and the bilingual lawyer, then just 30, won. To back Mr. Gallant’s second run for premier, Mr. LeBlanc has lent him one of his staffers, Kevin Lavigne. (Mr. Lavigne is a long-time friend of Mr. Gallant and gets credit for setting the Premier up on the blind date that led to his marrying Karine). Meanwhile, the Liberal machine has quietly worked to erode Mr. Higgs’s campaign. Mr. Higgs is seen through the window of a constituency office following a campaign announcement in Moncton. The one-time finance minister found himself under fire a few weeks ago for his poor French skills. Last week, the headaches of language politics were replaced by questions about an alleged secret plan for education cuts after Liberal communications staff released a study that dated back to Mr. Higgs’s time in cabinet. It recommended big cuts to provincial education programs at the time. Mr. Higgs, a soft-spoken father of four daughters, was vaulted back onto the defensive. At a news conference the next day at a campaign office in Moncton, volunteers sipped Tim Horton’s coffee and munched on Timbits while Mr. Higgs outlined a plan not to cut funding for teachers, but to give them more decision-making power in the classroom. The loudest applause, though, came when he backed away from the gritty details of his plan to increase test scores and announced that he also plans to scrap the Gallant government’s ban on junk food and allow chocolate milk back into schools. For this, supporters set down their coffees and gave such raucous applause that Mr. Higgs had to raise his voice. Mr. Higgs laughs with a supporter during a campaign stop in Moncton.